With the growth of small microbreweries in the metro and regional areas, consideration must be given to the processing and treatment of brewery wastes. Brewery drainage cannot be easily separated into individual waste streams and the waste is always a mixture of two basic waste streams. Hydraulic Services Engineer - What we do. A healthy sanitation system and clean water supplies are paramount in any community. The cleanest and safest methods of providing these outcomes stem from good design practices developed over many years. Designing critical life safety systems, such as fire hydrants and hose reels to protect building occupants, and allowing firefighting professionals to control and supress fires also falls to the Hydraulic Services consultant. The term 'best practice' has been used as the indication that a higher level of care and attention will be exercised when providing a plumbing design service to a client. This Hydraulic Design Case Study attempts to clarify what P.J.Wright & Associates Pty Ltd believes to be the definition of best practice. P.J. Wright & Associates Pty Ltd (PJWAA) provides a unique professional service being the ‘Forensic Services Review’ of hydraulic services designs and installations. For many years PJWAA have been registered with Expert Opinion Services, a development arm of the University of New South Wales. This organisation specialises in providing Expert Witness Consultancies for Legal Practitioners throughout Australia. 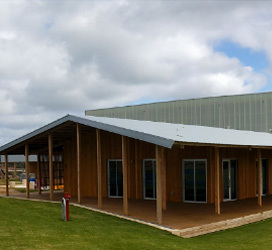 PJ Wright & Associates were commissioned by the Shire of Pingelly as part of the Erindale Pedersen Hook design team to document the Recreation and Cultural Centre in Pingelly. The scope of design works included sanitary and trade drainage, pump station design, hot and cold water, stormwater drainage, LP gas services, fire tanks and pumps, hydrant and hose reel and services. * Public Toilets and amenities building. The project required extensive planning and coordination with all design disciplines throughout the various design phases leading through construction. The main construction is timber with engineered timber portal frames giving the building a distinctive and airy appearance. Engineered service designs for hydraulic services where coordinated with the overall site works being undertaken by the shire. PJ Wright & Associates believe this project presents an excellent example of best practise engineering in public buildings. PJ Wright & Associates were engaged to design and document the Hydraulic Services for the Aveley North Primary School . The Stage 2 main primary school was to provide for 540 students, needing a total of five teaching blocks including the pre-primary and kindergarten teaching block. The incorporation of an Education Support Unit building into the school contract presented the design team with alternative design paramenters which formed the basis for major amendments to the primary school brief. The amendmnts were adopted into the Caversham South Primary School project (currrently under construction) and will be utilised again in upcoming primary school projects. The site works commenced late 2017 whilst stage 1 was being finalised. With careful project management, planning and the dedication of the design and construction team, the completion date was easily achieved and the school completed for the commencement of the 2019 school year. PJ Wright & Associates were engaged to design and document the Hydraulic Services for the Aveley North Primary School . Stage 1 was the Pre-primary and Kindergarten Annexe, incorporating transportable buildings. Liaison with the design team members during the design phase ensured the project was constructed in compliance with the Primary School Brief. The planning of service routes and connection points was essential to ensuring the installation of the transportable buildings occurred without the need to adjust site services and connection points. The site presented significant factors such as the lack of services to the site and ground conditions that if not addressed would have impacted on the construction program. Architects: Carabiner Builder: Universal Constructions Client: Western Australian Dept of Education. 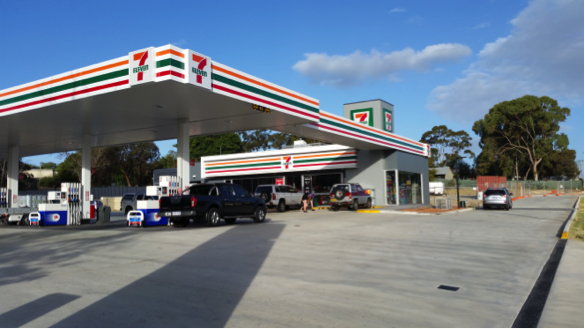 PJW & A provided the Hydraulic Services design and documentation for a new 7/11 Convenience store at 990 Wanneroo road, Wanneroo. The Convenience store is the first stage of the three lot development approved for the original site. The scope of design works included sanitary and trade waste drainage design, hot and cold water and stormwater drainage. The site has considerable fall which required careful planning of paving levels and grate locations. Another factor was that the rear of the site required vehicular access to the adjacent lot which was proposed to be a fast food drive through. Modification of the standard hydraulic services template supplied by the 7/11 was necessary to ensure compliance with Western Australian requirements. These were incorporated into our final design drawings which included service set outs and slab penetration details. The resultant design documentation packaged allowed for the construction to be completed within the short time frame allowed. PJW & A were engaged to undertake the design and documentation of a new commercial development at the corner of Yanchep beach Road and Welwyn Avenue, Yanchep for the Yanchep Beach joint Venture. The development went through many transitions until the stage was finally resolved. The scope of design works included sanitary drainage design, hot and cold water, stormwater drainage and fire services. Stage 1 consisted of two office blocks with a upper level link way that will form a central walkway in subsequent stages. Each two storey office block contains four commercial office suites. Subsequent stages will form a central spine and be surrounded by parking associated with each office block. A total of eight office blocks was planned with a total of 32 office suites. Master planning of hydraulic services was necessary to ensure that all installed services can accommodate the future expansion and development. Onsite Fire storage tanks and fire pump set was designed to fulfil the hydrant and hose reel requirements. Stormwater was designed in accordance with the Stormwater Management Manual to suit the specific ground conditions of the region. PJW & A were engaged to undertake the full restoration and upgrade of the historically significant ‘Dear Friends’ Restaurant in Caversham. From the initial feasibility to the final upgrade, PJW & A worked in close consultation with the RH Property (Project Managers for the developer). The scope of design works included the full replacement of the onsite wastewater treatment system, new domestic hot and cold water service, site and building stormwater disposal systems. Using the latest design methodologies, specific engineered design solutions were developed with suppliers and contractors that minimized site impact. A new Alterative Treatment Unit incorporating a ozone disinfection process was selected as the most environmentally friendly method for wastewater treatment. Flatbed leach drains were selected and installed in dispersal areas along the street frontage. These were landscaped with natural grasses to present a natural buffer zone between the carpark area and Benara Road. The site stormwater design incorporated a ‘permeable paving’ solution. The designs were based upon tested, site specific geotechnical data. The result was that a large portion of the carpark area was constructed as a trafficable lawn surface. The trafficable lawn area permits partial percolation with excess runoff collected by a sub-surface drainage layer for disposal to the street drainage. The result was a majority of the car parking that normally would be bitumen, was now an irrigated trafficable lawn area that could become multipurpose. Commercial Project: Fremantle Marine Operations Centre Capo D’Orlando Drive, South Fremantle. PJ Wright & Associates was engaged to undertake the full Hydraulic Services Consultancy for the Fremantle Marine Operations Centre in Fremantle. 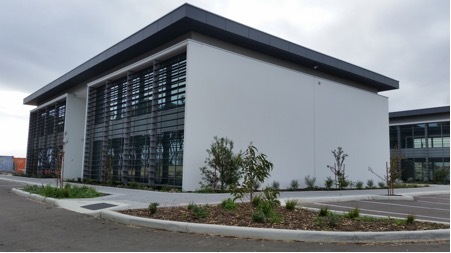 The development is located in Capo D’Orlando Drive, South Fremantle and required the refurbishment of existing buildings and new office accommodation to house the Department of Planning Infrastructure and Department of Fisheries. 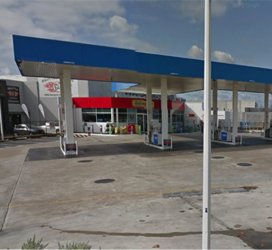 Commercial Project: Proposed Multi-Brand Showroom Frobisher Street , Osborne Park. 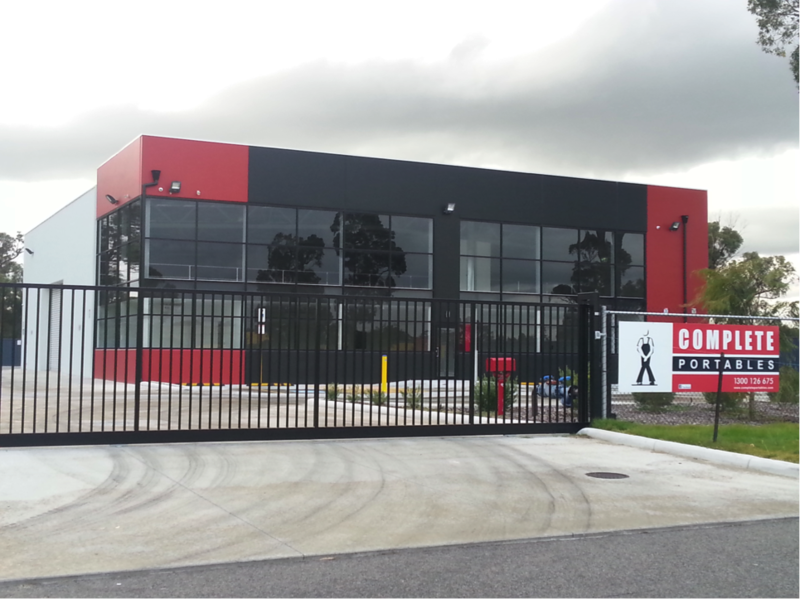 PJ Wright & Associates provided the Hydraulic Services design for a new Showroom building for the Barbagallo Motors in Osborne Park. 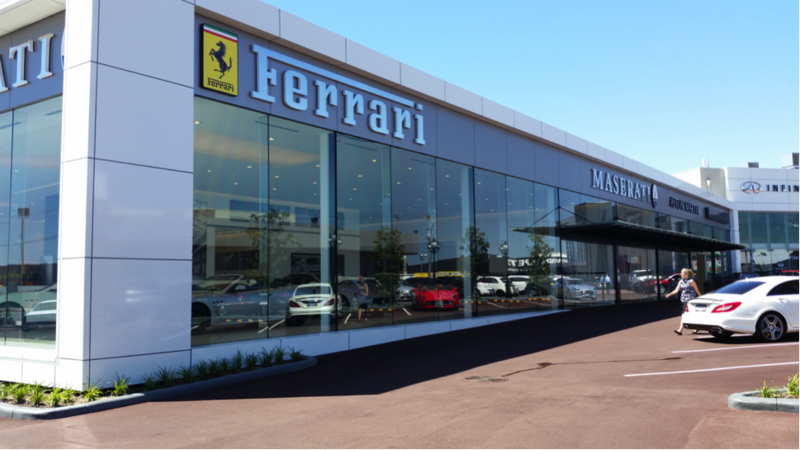 The new facility was to house multi-brand luxury vehicles such a Ferrari, Maserati and Aston Martin. Working in conjunction with the Oldifield Knott Architects, PJW & A designed and documented the Sanitary plumbing, stormwater collection and disposal, hot and cold water and fire services for the complete project. 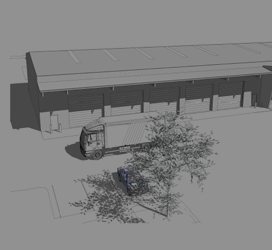 The client's brief required maximum exposure to the vehicles from both within and outside the building. The result was an expansive floor plan with full height glazed windows to the only two elevations. Service area where located at the rear of the buildings which were constructed along the site boundary. Services needed to be coordinated to ensure that concealment did not reduce the provisions for access. Special consideration was given to the roof drainage design due to the limitations the continuous glazed facades posed. The entry canopy required the design of box gutters and downpipes complying the the stringent requirements of AS 3500. The designs were developed in consultation with the Project Architect and Structural Engineer. PJ W & A were engaged to provide a full services package for the redevelopment of the historic Ship Inn on Albert Street, Busselton. The iconic Ship Inn underwent major refurbishment and renovations to ground floor service areas with revamped Bars, Kitchen and Restaurant areas. Part of the redevelopment was the construction of a new Dan Murphy’s Liquor store to replace the existing drive through facility. The new 1000 square meter liquor store was based upon the Dan Murphy’s specifications and services brief. The site had several historically significant buildings that needed to be taken into account resulting in the planning of main service routes in the early stages of the design. The Design Team coordinated all existing services and facilities to ensure adjoining buildings remained operational until modifications and alterations could be undertaken. With careful planning and coordination with the installation Contractors throughout construction, it was possible for both stages of the project to be completed within the short time frame allowed for construction. PJ Wright & Associates provided the Hydraulic Services design for a new office and warehouse Development in East Rockingham. Part of the development was the design of an Industrial waste flow control and monitoring systems for a Chemical Toilet Waste Receiving Facility located on the site. Working in conjunction with the designers at Complete Site Services, PJW & A designed and documented the Sanitary plumbing, stormwater collection and disposal, hot and cold water and fire services for the complete project. The stringent regional Development Guidelines required the incorporation of rainwater harvesting and recycling system which was utilized for the initial wash-down processes associated with the Waste Receiving Facility. Client: Complete Group Pty Ltd.
Institutional Projects: Joondalup Sub Acute (Intermediate Care) Facility Upney Mews, Joondalup, Western Australia. PJ Wright & Associates was engaged to undertake the full Hydraulic Services Consultancy for the Intermediate Care Facility adjacent to the Joondalup Hospital Site. The project required the design of sanitary drainage, hot and cold water, fire and gas services to the site. Mobility and Disability Services accommodation briefs were utilized and the site had accessing issues due to significant fall across the site. The designs took into account the level differences between buildings and other areas of the site. The development included 24 single bed accommodation units for transition care patients including disabled facilities all within a secure site. The main Administration and Common facilities were based upon mobility requirements and on site staff facilities were incorporated. Utmost in the minds of the Design team was the need to maintain a ‘Residential’ Feel to the facilities and maintain compliance with the brief. The Project incorporated the stringent Licensing and approval processes that the Health Department required for health care facilities. PJ Wright & Associates specified and detailed ACO Stormbrixx Infiltration Cells for the first installation of the product within Western Australia. Due to the nature of the site it was determined that concrete soakwells, which are often assumed to be the standard infiltration device within Western Australia, would not be suitable and an alternative product was required. PJ Wright & Associates researched alternative products and sought technical advice from a variety of manufacturers to determine what they believed would be the most appropriate solution for the required stormwater disposal on site. As we were first engaged to design the full Hydraulic Services at Stage 12, the existing site was already established and existing services were present across the majority of the site. This resulted in minimal area available for the excavation and installation of infiltration devices to cater for the additional stormwater catchment. In addition to above the Perth Groundwater Atlas had indicated that the presence of the groundwater was at a level to limit the depth of any device to a shallow system. If installing traditional concrete soakwells, this would result in a dramatic increase in the amount of soakwells and the installation footprint due to the required clearances between each soakwell in order for them to efficient. soakwells in both loading and infiltration and this often results in the products being overlooked in circumstances where they are more suited than the traditional options. The progression and technology of the products is now at a level that in many occasions they can be considered a more viable and cost effective alternative to concrete soakwells. 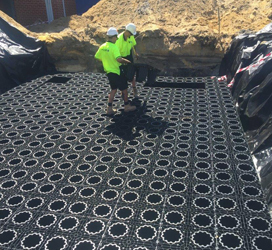 PJ Wright & Associates believe that the ACO Stormbrixx is the superior Drainage cell available in Western Australia. This is due to a void ratio of 95% and a vertical loading capability on the top face of 420kN/m2. PJ Wright & Associates were approached by Philip Nikulinsky Architect to develop a solution to a ground water problem at a private residence that was in construction. The lot contained a large landscaped area as well as a multi-level residence with below ground basement. Due to the natural contours of the lot and its location next to the Swan River, the geotechnical report determined a very high groundwater table flowing down the natural slope of the lot also accompanied by acid sulfate soils at a level approximately 1 meter below natural ground level. PJ Wright & Associates believed that there were different aspects that could be addressed in order to alleviate the ground water and the affect that it may have on both the construction and final residence. It was determined that drainage cells and geotextile fabric could be utilised to collect the flowing groundwater and provide a cut off upstream of the residence and construction location. The banks of cells were position at a level above the recorded acid sulfate soils but also within the ground water level. The ground water would permeate through the geotextile fabric and be harvested within the cell banks preventing downstream flow and minimising the impact on the building foundations. PJ Wright & Associates completed the design solution by utilising the harvested groundwater for irrigating the large landscaped areas. The environmentally sustainable solution resulted in reuse of the ground water as well as minimising potential damage that the ground water may cause to the building foundations and below ground basement. 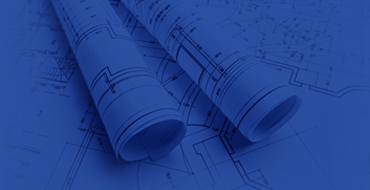 Close consultation occurred between PJ Wright, the Architect, Builder and Manufacturer of the drainage cells to ensure that the overall design solution and end result was efficient and achievable and clearly understood by all stakeholders. PJ Wright & Associates were engaged to provide the Hydraulic Services design for a new United Fuels service station at Ellenbrook for Robinson Buildtech. The project required comprehensive design and documentation of industrial waste and stormwater drainage to ensure all environmental considerations were acknowledged and addressed. By drawing upon our extensive experience in Service Station design, our consultancy team were able to provide hydraulic services designs that addressed the site and installation considerations, whilst complying with all requirements of the client’s brief. 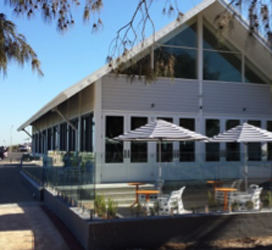 PJ Wright and Associates were engaged to provide a full services package for the redevelopment of the iconic Trigg Island Café located next door to the Trigg Island SLSC. The Café was completely refurbished with total replanning of the internal and outdoor areas. From the early feasibility/ concept stage through to final construction design with several designs developed. Modern finishes and fixtures have brought a new life to the Café which now incorporates a separate Restaurant & Take Away sections. Careful planning of new service routes was necessary to ensure connections to existing service infrastructure could be achieved. With careful planning and coordination with the installation Contractors throughout construction, it was possible for the project to be completed ahead of the time frame allowed for construction. PJ Wright & Associates been involved with Infant Jesus primary school since the early 1990’s, when significant expansion was undertaken at the school and the site was connected to the Ministers Sewer. Over time, access from Russell Street became a significant concern and the need to upgrade staff and administration facilities resulted in a Capital Development Plan (CDP) being prepared by the Project Architect. Due to the limitations of access from Russell Street and the need for new modern teaching areas, the CDP was developed for the staged replacement of all building to the southern end of the school. The progressive design of new two storey classroom blocks, undercover assembly/ hall, canteen, library, staff and administration facilities was undertaken in consultation with the School and the P & C group. The new modern facilities were developed around a central courtyard area with interconnected walkways. Critical to the completion was the preplanning of services to accommodate successive stages to be constructed with minimal or no impact of school operation during construction. 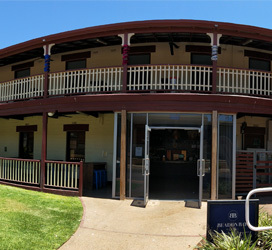 The original Administration Block was converted to a Kindergarten, thus allowing the historically significant building to remain as a functional area of the school. 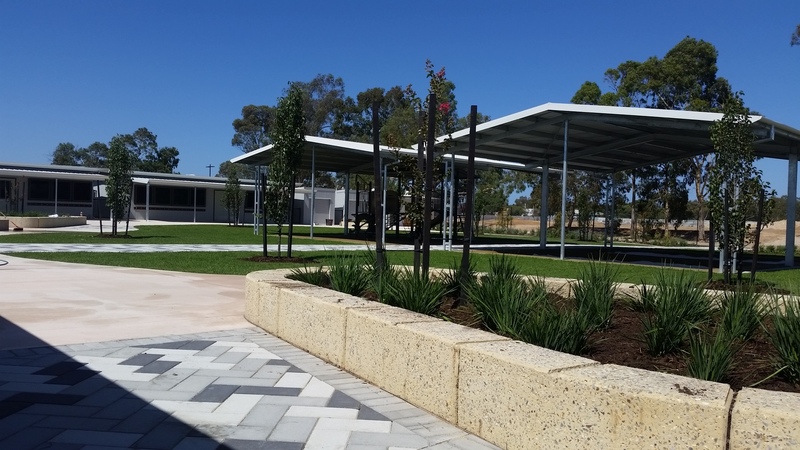 PJ Wright & Associates have completed the staged design of Hydraulic Services for the existing Primary School located in Leederville. Aranmore Primary is one of the regional “feeder” schools for the Aranmore Catholic College in Mount Hawthorn. PJ Wright & Associates have been associated with the school’s redevelopment over many years. The school was originally known as St Marys Primary and has undergone reconstruction through a Capital Development Plan (CDP) developed by the Project Architect. Sanitary and stormwater drainage, fire services, hot and cold water and gas services have been redesigned, diverted or upgraded to accommodate new buildings whilst minimizing disruption to the school throughout the construction stage. Works have included a new two storey classroom block, new hall and canteen, library refurbishment, administration refurbishment, new kindergarten extension, refurbishment of existing pre-primary classrooms and kindergarten, new undercover assembly and general site upgrades. Throughout the various stages of master planning, the project design team were able to provide the School Administration, staff and students with a modern learning facility catering for pre-primary age through to year 6. 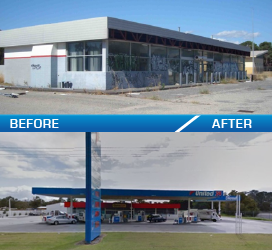 PJW & A provided the Hydraulic Services design for the refurbishment and upgrade of a Service Station site on Gnangara Road, Lexia. United Petroleum where the developers and required the existing services to be replaced and renewed o their stringent standards. c) Artesian water supply drawn from an existing bore with water treatment system for potable supply to building. With careful planning during design development stage with the Architect, the Client and Health Department, Local Authority, allowed development of the site back to a operational Truck stop whilst ensuring all health and environmental conditions imposed on this redevelopment were complied with. 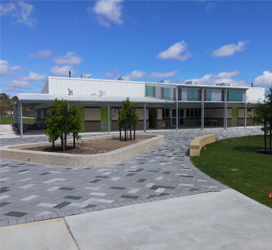 Institutional Project: Tuart Rise Primary School Kempeanna Way , Baldivis, Western Australia. 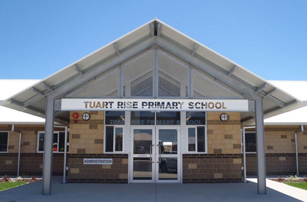 PJW & A has undertaken the Mater Planning and Staged design of Hydraulic Services for the recently completed Tuart Rise Primary School in Baldivis . The project was completed in two stages. Stage 1 was the Early Childhood / Pre-primary Block and Kindergarten Annexe, incorporating permanent and transportable buildings. Stage 2 was the completion of the main primary school and site works. The ‘greenfield’ site has been developed through Master Planning from the initial Kindy Annexe stage to permit future extension of installed sanitary drainage, fire services, hot and cold water and gas services to allow the completion of the project. Thorough consultation with other Design Team members during the design phases ensured the project was fully coordinated allowing the final project to be constructed in compliance with the Primary School Brief. 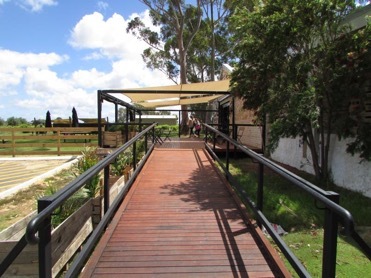 The Second stage was constructed successfully whilst maintaining security and safety of the Early Childhood Annexe which was fully operational at the time. PJW & A provided the Hydraulic Services design for the remodelling of the existing heritage listed Beadon Bay Hotel in Onslow. The existing hotel was was built in 1924 and required substantial remodelling of the interiors and services. The complete Group who are undertaking the development have also incorporated two new accommodation blocks. The two storey accommodation blocks will have 80 motel units and will be prefabricated in Perth. The Complete Group Design Team and P.J. Wright were able to coordinate the service connection points for all prefabricated units to provide final site and building services designs that permitted installation of components in a staged construction phase. The site has many limiting factors that required consideration by the design team. Refurbishment of the hotel incorporated a new kitchen, bar and toilet facilities and conversion of the upper level for dinning and functions. The development will include a new beer garden and liquor store outlet. PJ Wright & Associates were engaged to undertake the full Hydraulic Services Consultancy for the additions and alterations to an existing Kilmolee convent building in Shoalwater Bay. The existing convent was built circa 1970 and required substantial upgrade and replacement of hydraulic services to the building and site service. Working in conjunction with Tom Lemann (the Project Architect) the building was redeveloped to provide more modern facilities and spacious living areas for the resident Sisters. 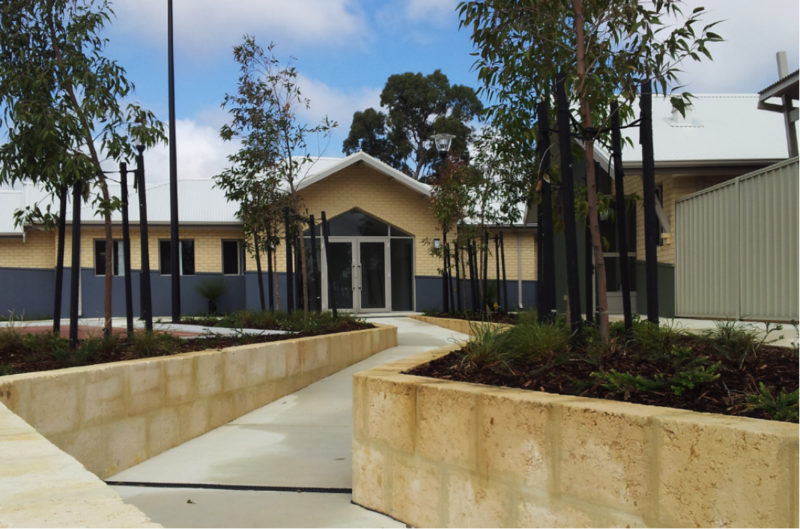 New sanitary and stormwater drainage, hot and cold water, gas and fire services were designed to provide the most cost effective solution resulting in minimum disruption to adjacent residences and the existing Penola Conference centre which is located on the same site. PJ Wright & Associates provided the Hydraulic Services design for the additions and alterations to an existing Kilmolee convent building in Shoalwater Bay. 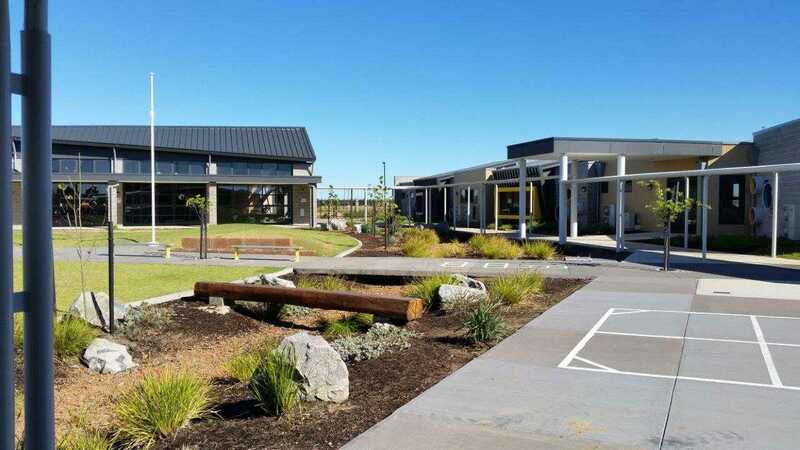 New sanitary and stormwater drainage, hot and cold water, gas and fire services were designed to provide the most costs effective solution resulting in minimum disruption to adjacent residences and the existing Penola Conference centre which is located on the same site. 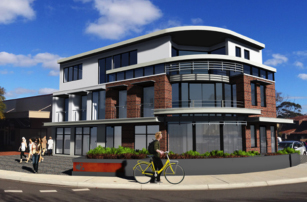 PJ Wright & Associates provided the Hydraulic Services design for a ten apartment multiple unit development for Bold Green Developments in Leederville. The building consisted on a lower ground floor car park area with three storeys of residential units over. The site was small and compact with the building covering the majority of the lot. The designs prepared by PJ Wright & Associates required coordination with structural and other engineering disciplines to ensure clashes between services and structural elements did not occur. The development incorporated a Fire Engineering Solution utilizing a Brigade Booster as an alternative to Tanks and pumps with internal hydrants. 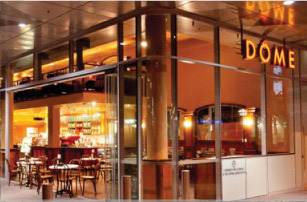 PJ Wright & Associates provided the Hydraulic Services design for the ground floor fit out of 197 Westralia Plaza Perth for Dome Cafes. The design and documentation required the careful detailing of new hydraulic services from existing services infrastructure with minimal impact of surrounding tenancies. The designs prepared by PJ Wright & Associates required coordination with the extensive existing services obviate costly reworking of installed services. Utilizing the “Dome’ Fit Out Brief PJ Wright & Associates we able to coordinate and provide cost effective service designs . Commercial Project: South West Sports Centre (Bunbury) 1 Rotary Ave, Bunbury, Western Australia. PJ Wright and Associates were commissioned to provide the Hydraulic Services design for the solar pool heating system at the South West Sports Centre for the City of Bunbury. The new evacuated tube solar heating system was designed in consultation with Supreme Heating and the on-site engineering staff . 150 x 30 tube collectors were arranged in to 10 arrays with a balanced pipework design and connected to the existing Olympic size lap pool heating circuit in order to preheat the water prior to the existing gas boiler system . Similarly 90 x 30 tube were arranged in to 5 arrays with a balanced pipework design to preheat the Leisure Pool. The entire solar circuit was designed as a closed low pressure circuit which allows maximum energy transfer at lower operating pressures. The orientation and set out of the arrays was undertaken to provide maximum solar contribution during winter months. This was made more difficult as the roof was curved. The system is the largest solar pool heating system in the southern hemisphere. 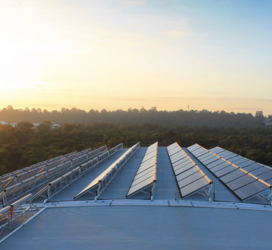 PJW & A have also completed similar solar pool heating designs with Supreme Heating for Perth College, Maylands and Melville Aquatic Centre in Booragoon. Contractor: Supreme Heating WA Client: City of Bunbury. With careful consultation with the Architect, the Client and Health Department, Local Authority, PJ Wright & Associates were able to provide the Client with a set of documents which fulfilled the stringent Town of Port Hedland requirements for Commercial developments. 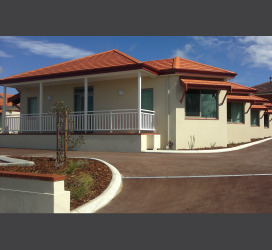 Architects : CADDS Architectural Client/ Builder: Karratha Contracting. 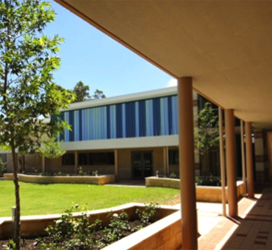 Institutional Project: St John Bosco College (Forrestdale Catholic College) Armadale Road Piara Waters, Western Australia. 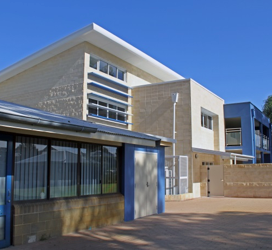 PJ Wright & Associates has undertaken the Mater Planning and Staged design of Hydraulic Services for this new Catholic Education Office College which caters from Pre-primary through to Year 12 Seniors school. The ‘greenfield’ site has been developed through Master Planning to allow expansion of the college in four to five stages. Sanitary drainage, fire services, hot and cold water and gas services have been pre-planned in order to minimize disruption of the college whilst new works are constructed. 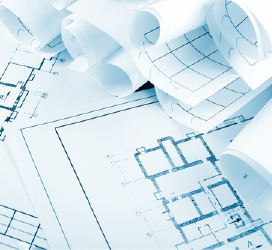 Through consultation with other members of the Design Team has ensured services are fully coordinated allowing for clear documentation for the Builder and Contractors. The selection of fixtures and tap ware has been coordinated with Interior Designers to ensure a high quality of product is installed. It is believed the overall finish of the college will set a new benchmark for future College developments. Architects : Santelli Architects Client: Roman Catholic Archbishop of Perth. 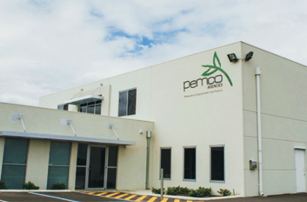 PJ Wright & Associates provided the Hydraulic Services design for a new office and warehouse facility for Pemco Agencies, a leading wholesaler and distributor of quality health care, natural and organic products in Western Australia. Working in conjunction with the designers at Manor Homes PJ Wright & Associates designed and documented the Sanitary plumbing, stormwater collection and disposal, hot and cold water and fire services for the complete project. 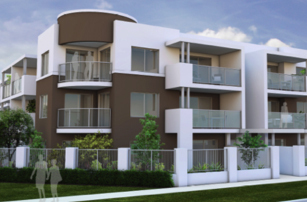 Designer/ Builder: Manor Homes Pty Ltd Client: Pemco Agencies Pty Ltd.
PJ Wright & Associates provided the Hydraulic Services design for a 27 unit, three storey, apartment development in East Victoria Park. The project required amalgamation of two residential lots. Prior to the final clearance being awarded for the amalgamation, the WAPC required the diversion of a Water Corporation sewer to service an adjacent site and clear an existing easement encumbrance on the proposed site. PJ Wright & Associates undertook the Design, Documentation and Construction Engineering of the Sewer Diversion which ran down the centre of Swansea Street and along Forward Street. In addition, in order to achieve Planning Approval, PJ Wright & Associates prepared the stormwater management plans for the development which was later incorporated into the final Hydraulic Services design. The building consisted on a ground floor car park area with two storeys of residential units over. The Hydraulic Services designs prepared by PJ Wright & Associates required coordination with structural and other engineering disciplines to ensure clashes between services and structural elements did not occur. This Project was one of the first that utilized a Fire Engineering Solution utilizing a Brigade Booster as an alternative to Tanks and pumps with internal hydrants. Project documentation was completed in readiness for the Building Permit Certification. 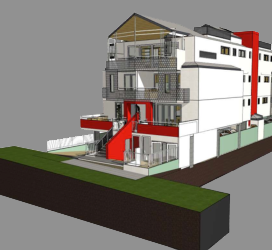 PJ Wright and Associates provided the Hydraulic Services design of a three storey mixed use development in Applecross. The building consisted on a ground floor car park area and commercial shop tenancies, commercial office tenancies at the first floor with a residential unit at the upper level. Working in conjunction with the designers at Sovereign Home Builders, PJ Wright and Associates designed and documented the sanitary plumbing, stormwater collection and disposal, hot and cold water and fire services for the complete project. The site was very compact having a total area of 235 square meters poses significant issues with setting out services to accommodate the various usages and allowing flexibility for tenants.